Crypto-currencies and bitcoin are the hot topics in the world of finance right now but they are failed to impress the Nepal’s Central Bank, Nepal Rastra Bank. Nepal Rastar bank had announced on August 13th, 2017 as the transaction of Bitcoin is illegal in Nepal. As the notice was published on August 13th, Deputy Director of Nepal Rastra Bank, Kedar Prasad Acharya, had already said “Bitcoin is Illegal in Nepal” in an event organized at Thames International College, 30th June 2017. Nepal Rastra Bank had not mention Crypto-currencies any where in the notice, It is specially focused in Bitcoin Only. Every foreign currency exchange shall be conducted taking approval from Nepal Rastra Bank, As per Nepal Rastra Bank Act, 2058 B.S and Foreign exchange act, 2019 B.S. Bitcoin has not yet been approved as a currency in Nepal, as per informed in internet some peoples are transacting Bitcoin. 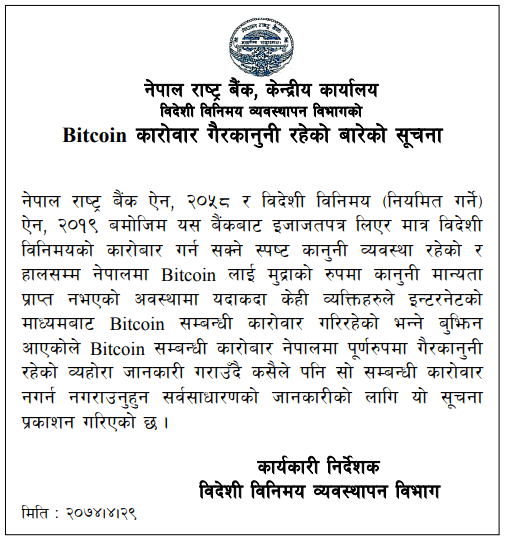 This Notice is to inform all Any transaction of Bitcoin is illegal in Nepal, none shall operation bitcoin in Nepal. 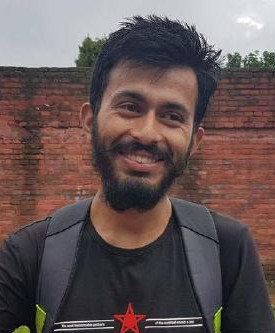 Bitsewa, has closed its services Iegality issues of bitcoin in Nepal. Bitcoin is Illegal in Nepal Central Bank of Nepal Any Post shared Here are for information Purpose Only. Bitcoin is a Great combination of cryptography and block-chain technology. Hoping Government focus on developing these technology. Every technology have its bad and good aspects. Its Our Country, Our Choose Government. Let respect the rules and wait for legally approval of Bitcoin. Have a good day!